Vittorio Santoro. 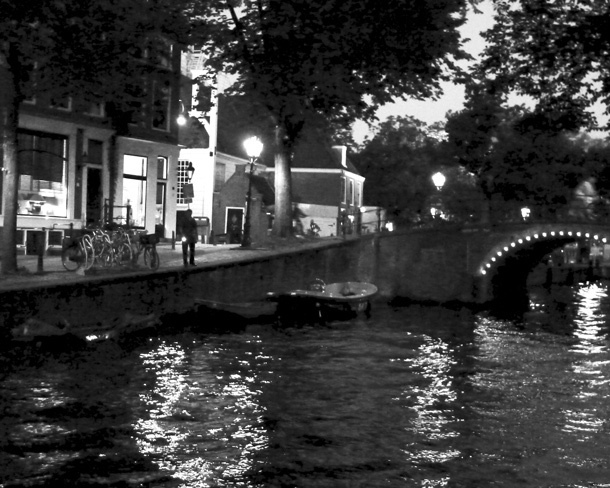 Searching For… (One Day and Night in Amsterdam) 2012. Eighteen black and white photographs. I spent a day and part of the night walking around Amsterdam with a flashlight. Some of the locations where chosen with reference to the artist Bas Jan Ader. This photo work corresponds with an action that BJA would have carried out at his arrival in Amsterdam had it not been for his untimely disappearance at sea in 1975. Further, this unrealized work of BJA echoed a previous work made by him two years before in Los Angeles entitled Searching for the Miraculous (One Night in Los Angeles) (1973), in which he walked with a flashlight through the city toward the Pacific Ocean. Vittorio Santoro. 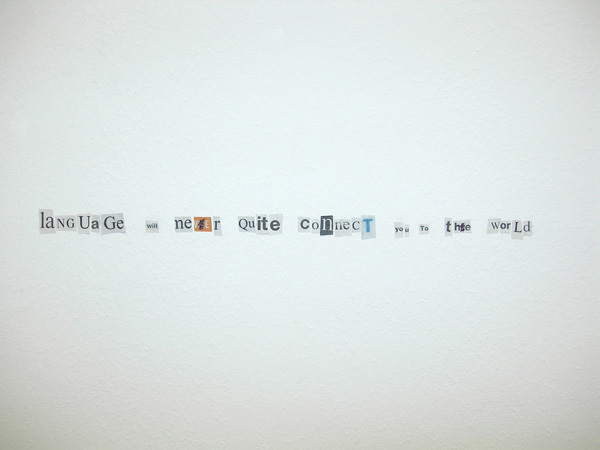 Language Will Never Quite Connect You To The World, 2008.Newspaper cut out letters on wall. The collage Language Will Never Quite Connect You To The World(2008) inhabits in a hardly visible fashion the section of a wall. It is made of letters cut out from different newspapers of a given day, more exactly: from some selected newspaper articles. The selection of articles is fully authorized by the interpreter (who can be, but is not necessarily the artist and) who spends one day with the task. The letters form the sentence whose meaning oscillates between a disillusioned avowal and a plea for action. to a Parisian address. Subsequently, the sheets were partly covered with India ink so as to horizontally block out the lower half of each word and the space underneath. Vittorio Santoro est né en 1962 à Zurich. Il vit et travaille entre Paris et Zurich. Développant un travail conceptuel et référentiel, l’oeuvre de Vittorio Santoro prend la forme d’installations sonores, de sculptures ou de dessins. Son oeuvre articulée autour de répétitions et de formes littéraires questionne autant l’inscription de l’oeuvre dans l’espace et dans le temps que l’inscription ontologique de l’individu dans son espace social. 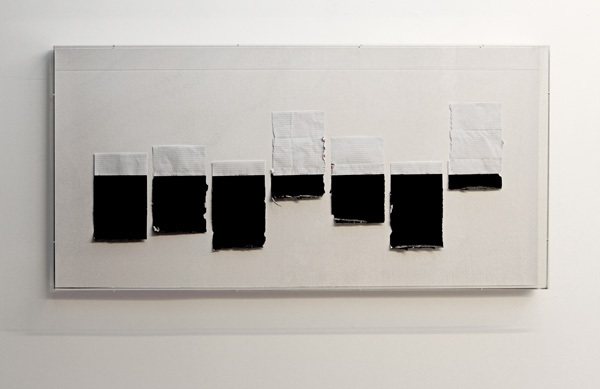 Son travail a été montré à l’occasion de différentes expositions: Fondation Richard, 2012. Centre Pompidou, 2012. Rosascape, 2011. Irish Museum of Modern Art, 2011. CAPC Bordeaux, 2010. BF15 de Lyon, 2011. FRAC Aquitaine, 2010. Contemporary Art Center Vilnius, 2009. ARTforum Berlin, 2007. Kunstmuseum Thun Berlin, 2006. Tate Modern Londres, 2006. He is represented by the Galerie Jérôme Pogggi, Paris.